Starting in late November, many stores along New York City's Fifth Avenue and other streets in midtown Manhattan create their magical annual holiday windows . 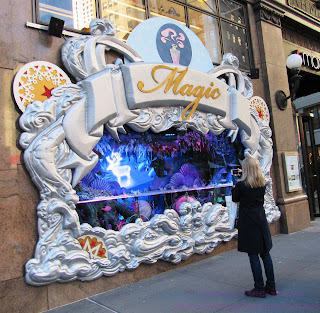 The holiday window displays are a one of the best things to do in New York during the holidays for both locals and tourists. This year's designs are some of the best , with Tiffany & Co depicting the ideal N.Y.C. Christmas , Saks Fifth Avenue displaying their iconic, animated holiday-themed "Land 1000 Delights" windows, and Lord & featuring 34 hand-crafted woodland animals for their "Enchanted Forest" scenes. 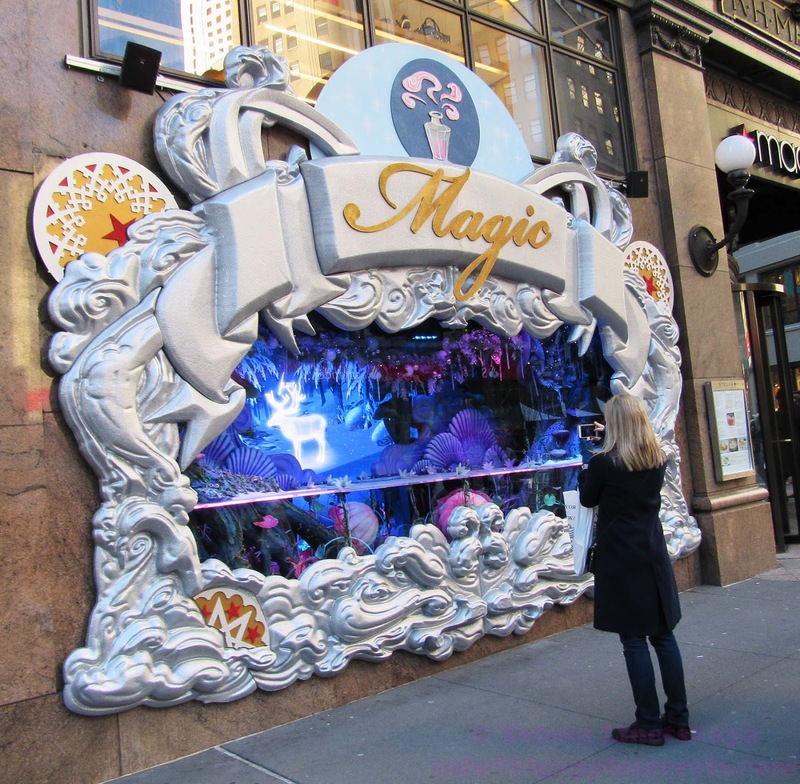 Bergdorf Goodman too went all out with five window displays taking viewers to "Destination Extraordinary." 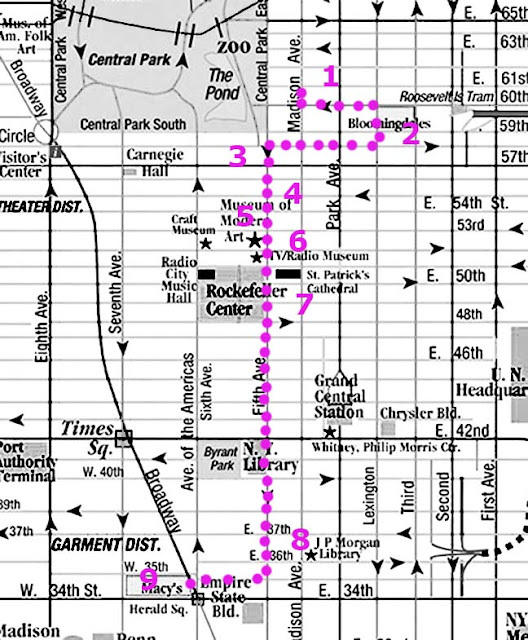 I created a map with nine stops for a walking tour to see the best of the holiday windows in New York. This walking tour covers approximately two miles and should take an hour and a half or longer . Of course shopping time is not included . But be prepared - you’re going to run into crowds. It may even be lines to see some windows. To avoid it try going later in the afternoon after 9PM when the stores are closed. But in this case you will not be able to enter the stores and to see how wonderfully these stores are decorated inside. If you are lucky to be an early bird and working in the city as I was you have an excellent chance to find you alone watching the windows at 7:30 AM. Try to avoid Christmas week when thousands of kids are on vacation. You can start the walking tour either from the northern point or from the south- it does not matter. I prefer to start from the north and finish it at Macy's because there is huge Subway hub at 34th street and I can easily return home. Stop 1. Barneys, 660 Madison Avenue Theme: "Love Peace Joy Project"
Stop 2. Bloomingdale’s 59th Street and Lexington Avenue Theme: "Light"
Stop 3. Bergdorf Goodman 754 5th Ave at 58 street Theme: "Destination Extraordinary"
Stop 4. 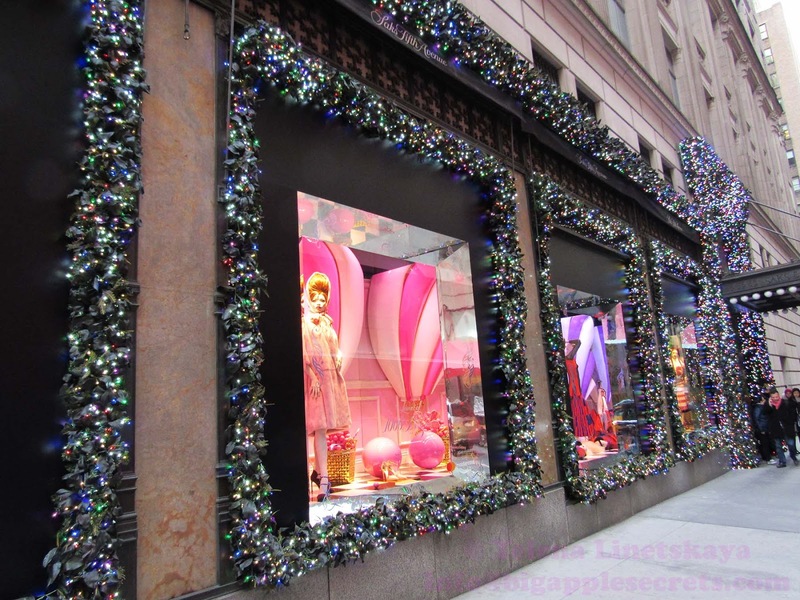 Tiffany 727 5th Ave at 57 street Theme: "Make the World Sparkle"
Stop 5. Henri Bendel 712 Fifth Avenue. Theme: " From Bendel With Love"
Stop 7. Saks Fifth Avenue 611 5th Ave between 49th and 50th Theme : "Land of 1000 Delights"
Stop 8. Lord & Taylor 424 5th Ave at 39th St "Enchanted Forest"
Stop 9. Macy’s 34th Street between Broadway and 6th Avenue The Miracle on 34th Street and "Believing the Magic."